Caijing, edited by Hu Shuli, recipient of World Press Review's 2003 International Editor of the Year award, was a media leader when SARS broke out, providing detailed reports on the spread of the disease (Photo: Qu Jin/China Features). Ms. Xie, a retired worker in Taiyuan, developed a fever and breathing difficulties soon after coming back from Beijing, where she had attended a family funeral. She immediately went to the Provincial People’s Hospital in Shanxi province’s capital, Taiyuan, to seek medical treatment. This was March 23, 2003, eight days after the World Health Organization (WHO) gave the name SARS (severe acute respiratory syndrome) to the contagious disease first known as “atypical pneumonia” and confirmed that the disease could become a worldwide threat. Many people heard the rumor that SARS had come to Beijing and that You-an Hospital was being used as a specialized treatment center. If only Xie had been one of those well-informed people, at least she would have told the doctors at the People’s Hospital about her brother’s suspicious symptoms. If she had had more knowledge about the disease, she could have realized how dangerous her condition was. But unfortunately, Xie was in Taiyuan, in Shanxi province. She did not understand English and knew nothing about the Internet. She did not even hear the rumors. She thought what she had caught was no more than a common cold and fever; thus she did not mention her brother’s unknown cause of death. She was put in the emergency room for temporary observation, but died three days later. She was diagnosed with SARS just before she died. In Shanxi, where medical facilities are generally relatively poor, the Provincial People’s Hospital is among the best. But it is a general hospital with no specialized contagious-disease division, and it had never before treated such contagious patients. After Xie was identified as a suspected SARS patient, the hospital sealed off the emergency room’s observation area where she stayed. But the electrician who wired the area—and more than 10 employees—were infected with the virus. The last one infected was Liang Shikui, deputy chief of the emergency room. The 57-year-old Liang became gravely ill and ultimately died at 8 a.m. on April 24. On March 27, WHO finally changed the number of SARS cases in China from zero to “972 cases in Guangdong province.” Afterward, it listed the following places as “affected areas”: Hanoi, Singapore, Toronto, Guangdong province, Beijing, Shanxi province, Hong Kong, and Taiwan. Designating Shanxi an affected area was not an exaggeration. Shanxi reported only four confirmed SARS cases on April 2, but the number rose to 24 by April 6. On April 14, after the Ministry of Health adjusted the SARS diagnosis standard, the number increased by 50 in a single day, bringing the total to 82. There were 95 confirmed cases on April 18. As one of the more economically underdeveloped provinces in central China, Shanxi’s SARS situation seemed particularly cruel. People could not help but ask: Why had Shanxi become one of China’s worst-hit areas? How did SARS get there? Some speculated that vinegar vendors who traveled from Guangdong to Shanxi for business might have brought the disease to the province. However, Caijing’s investigation tells a different story. 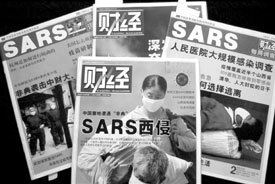 When reporting on SARS, the Shanxi government regularly used the terms “imported cases” and “locally transmitted cases.” The term “imported cases” referred to those brought from outside of the province; “locally transmitted cases” referred to those in which the virus was transmitted to the patient locally. What needed to be done was to analyze where SARS was imported from and how it was transmitted locally. The source of the first chain, Ms. Yu, sold jewelry at a rented counter in a department store in Taiyuan. In late February, she was infected with the disease during a business trip to Guangdong province. She had a fever and chest discomfort, but at that time Guangdong’s media coverage on “atypical pneumonia” had been quieted down. Coming from Shanxi, Yu had no idea that the epidemic that had created panic was still out there, that she might catch this deadly virus. She was never told to go to a local hospital for medical attention. Instead, she returned to her home in Shanxi. Her condition deteriorated, but she remained with her family and had frequent contact with her parents, relatives, and friends. When Yu did not show any progress after treatment, her family lost faith in Taiyuan’s local hospitals. As is customary for affluent locals, on March 1, Yu drove a rented car all the way to Beijing for medical treatment. On March 7, she was diagnosed with SARS at Military 301 Hospital and later was transferred to 302 Hospital. But it was too late. Eight members of her family, including her parents and her husband, all developed similar symptoms. One after the other, the whole family arrived in Beijing for treatment. From what Caijing has learned, Yu was the first SARS case in Beijing. She infected a number of hospital staff with the virus. Soon her parents died from SARS in Beijing. She and her relatives were later asked to transfer back to Shanxi to continue their treatments. That was when Shanxi’s medical circles first witnessed the contagious power of SARS. Five hospital staff members were infected with SARS at Shanxi Provincial People’s Hospital, where Yu was treated. Disease-control workers in Shanxi quickly took measures to fight the spread of the disease, although it was mostly “to mend the fence after the sheep were lost.” On March 9, the chief of the Taiyuan Disease Control Center, Zhao Baoxing, and his team rushed to Beijing. They found Yu in her sickroom. They asked questions in an effort to understand the nature of the disease and identify people with whom Yu had contact. Using the “epidemiological investigation” process, Zhao Baoxing and his staff developed a list of 30 individuals who had been in close contact with Yu. In accordance with the instructions given by higher authorities, these individuals were put under medical observation. As expected, four of them later developed symptoms and were immediately sent to hospitals for medical treatment. Within Yu’s chain, nearly 20 people were hospitalized. The potential impact of what was avoided is unfathomable. On March 20, at Taiyuan’s Provincial People’s Hospital, a patient who had been to Beijing’s 301 Hospital to treat an oral canker came in, still seeking treatment for the canker. The patient, Yue, the party committee secretary in Shanxi’s Qingxu county, near Taiyuan, also had a fever. Many colleagues came to Taiyuan to visit him when they heard he was hospitalized. On March 23, Yue was identified as a suspected SARS case. But the diagnosis came too late. The chairman of the local political consultative conference of Qingxu who had visited him died from SARS on April 5. Four days later, the driver of the county transportation bureau, a 32-year-old man who had driven Yue to Beijing, and his wife were identified as infected with SARS. Both later died. Qingxu, a rich county, produces vinegar. During Guangdong’s SARS outbreak in early February, rumor spread that vinegar could prevent SARS. Vinegar prices increased, and vendors came to Qingxu to buy more of the product. “We had heard about this ‘atypical phenomenon.’ But we always thought it was far from us. And besides, we heard that it was already under control in Guangdong,” Chuo Ruiyi, head of the Qingxu County Disease Prevention Station, told Caijing. Chou was wearing a protective suit. His office was filled with the smell of disinfectant. Chuo was certain that although many people had visited from Guang-dong, no Qingxu SARS cases were traceable to infections from those visitors. “The first SARS case was Yue,” he said. Of course, neither Chuo nor Yue knew that this disease had not disappeared in Guangdong, or that it had stealthily entered Qingxu via Beijing. Qingxu became an affected area almost overnight. Since late March, Chuo and his crew of 40 prevention workers had been working nonstop, day and night. They had been busy persuading suspected patients to go to hospitals, recording and observing symptoms of those who might have been exposed to SARS, and looking for new suspected cases. “At that time we were not allowed to call it SARS, it was kept secret. So we told people it was something called ‘spring respiratory infection.’ Many people could not understand why they had to be hospitalized for it. How they resisted us then!” recalled Ma Xiuzhen, the accounting manager of the Prevention Station. According to Chuo’s records, in the Yue chain, seven had been in close contact with Yue and 128 were put under medical observation; ultimately 24 were hospitalized and two died. Most of the close contacts and people under observation were locals from the county. A sprawling and lengthy chain of transmission, plus three deaths, made Qingxu the worst-hit SARS area in Shanxi. The county’s streets are still quiet. The schools are closed. The people of Qingxu are shunned wherever they go, even at the hotel check-in desks in Taiyuan. As of mid-April, diligent specialists on the front lines of Taiyuan’s SARS prevention and control were still tracing patients from the first chain of infection. In addition to the above three chains, there was another chain, connecting some 20 people, whose origin was unclear. SARS is an extremely contagious disease, more vigorous than any known respiratory infection. Because preventive efforts and treatment were kept top-secret as required by the government, prevention workers were not able to educate the public or enlist their support in the fight. It is hard to imagine that Shanxi’s fragile medical system could have warded off the epidemic’s spread under these circumstances. In this fierce battle, the army fighting on the front line of epidemic prevention is short of supplies. Chuo Ruiyi is a surgeon, transferred from the military. He was appointed chief of the Disease Prevention Station of Qingxu county in 1984. As far as he can remember, the station received funds to invest in equipment only once during that 20-year period. That was back in 1986, when the station spent 100,000 Renminbi [RMB] (US$12,000) on basic testing instruments and a refrigerator. Since 1999, funds from the county treasury have been insufficient. The station has had to generate income from sanitation supervision services, and this has been barely enough to pay its employees’ wages. often did not have enough money to pay its workers. As the station faced the epidemic situation this year, its money problems seemed more serious than ever. After the first SARS patient was found on March 24, the finance manager, Ma Xiuzhen, bought some hospital uniforms and disposable suits for disease prevention. On April 17, she was finally able to pay for the material when 20,000 RMB ($2,400) in emergency funds allocated by the county finance department arrived. On April 24, one month after the SARS alarm rang out, Ma Xiuzhen scrounged together some money to buy instant noodles and ham, allowing workers who had been working till 2 a.m. every day to finally get a late-night snack. “It really hurts to see them like that. They have worked too hard these days,” she wept. Taiyuan’s Disease Control Center, which bears even greater responsibility than the County Disease Prevention Station, predictably found itself in a difficult situation. The director, Zhao Baoxing, did not have time to do detailed calculations, but he knew that they were “very short-handed.” Of the center’s approximately 200 employees, more than 100 were transferred to a newly formed epidemiological investigation team. All they could do was work endless hours of overtime. Zhao was so busy and exhausted that interviewing him was difficult. He constantly had to answer the phone, and he dozed off frequently. Seeing him like that, we felt reluctant to ask questions. Our reporter went along with his investigation team to a SARS-infected site. After the crowd scattered, Chief Zhao was found asleep, leaning against a big willow tree. As Deputy Governor Wang Xi told Caijing, the disease-prevention system in Shanxi province is outdated. Equip-ment and staff numbers are inadequate. But its medical system is among the better ones in China. Besides Shanxi’s county hospitals, town and village clinics remain (they have not been sold off). Cooperative medical facilities exist in 88.9 percent of the villages in the province. According to Wang Xi, the Rural Area Health Project, launched in 1998, used some of the province’s own money and some from the national government to rebuild prevention stations, women and children’s clinics, and town and village clinics (or central medical centers). A cooperative medical treatment system was gradually set up, and training programs for grass-roots medical workers were established. Currently, Shanxi spends about 10 million RMB ($1.2 million) on the Rural Area Health Project and clinics. But Shanxi is a big province with more than 1,800 clinics, and the funds are utterly insufficient. There are not many good hospitals in Taiyuan. The best three, the Provincial People’s Hospital, and the Shanxi Medical School No. 1 and No. 2 affiliated hospitals, were designated as specialized hospitals for the treatment of SARS from the very beginning. However, these hospitals had inadequate equipment and facilities to handle a sudden crisis. The diagnosis, treatment, and care of respiratory diseases like SARS require specialized doctors and nurses. Special equipment such as respirators, blood and oxygen monitors, and bedside X-ray machines also are necessary. Li Junfeng, the Health Bureau Director, told a Caijing reporter that there are only a few hospitals in Shanxi equipped with respirators, each with 30 to 40 beds at most. By early April, it was difficult for the hospitals to take in patients. One patient went so far as to tear away a doctor’s surgical mask and spit on him when he was told not to check into the hospital right away. Wang Xi worries about the prevention and treatment capabilities in the western parts of the province. With relatively poor medical facilities there, it is difficult to detect and diagnose SARS cases. Lu-liang, for example, just bought two respirators, but it is not clear whether anyone there can operate the machines proficiently. More ominously, more than a few SARS cases have been found in the west. By 6 p.m. on April 29, there were five suspected and confirmed cases in Yi-zhou, three in Lu-liang, and five in Shuo-zhou. The danger signs have begun to show. Although those who have become wealthy in Taiyuan can afford to go to Beijing to seek medical treatment, Shanxi is one of the poorest provinces in China. It was once affluent and important, but in recent decades, this inland province has experienced sluggish economic growth. In the early 1980s, its per-capita gross domestic product ranked about 10th nationwide. It dropped to 17th in 1998, and 18th the following year. In 2001, its average per-capita GDP was just one-fifth of top-ranking Shanghai’s. Now, as the deputy director of the provincial finance bureau, Wang Ya, put it, most cities and counties in Shanxi are in so-called “just fill-the-stomach” fiscal condition and at least half have financial difficulties, barely managing to make ends meet. He explained gloomily that there are two uncertainties. One is not being able to determine how long the epidemic will persist; the other is that the scope of the epidemic is unknown. Wang also mentioned that in addition to the worrisome possibility that the disease might spread to rural areas, the coal mines remain problematic. With their relatively small working spaces and crowded living conditions, if the epidemic intrudes, the consequences would be unimaginable. “Coal production would be greatly jeopardized,” he said. That would ultimately affect the national energy supply. Shanxi is still under the SARS shadow, and it is still fighting.This is a battle that must be won. This article has been excerpted from the original version that appeared in Caijing magazine.